Motorcyclists making their way to this year’s TT Races have responded well to a Merseyside Police/Datatag joint initiative designed to reduce, and raise awareness of, motorcycle theft. Nationally motorbikes are becoming increasingly attractive to thieves, both opportunist and as part of organised criminal groups as such Merseyside Police -Vehicle Crime Group teamed up with ‘The Steam Packet Company’ and the country’s leading bike security experts at ‘Datatag’ to give crime prevention advice to approximately 4000 bikers heading through Liverpool’s Pier Head port to this year’s races. As well as providing bikers with information leaflets explaining ways they can make their machines less likely to be stolen, including security marking, the officers spent time examining bikes. This lead to the recovery of at least 2 stolen machines, the identification of another 6 suspected of being stolen and currently subject to enquiries with manufacturers and arrests for handling stolen goods. 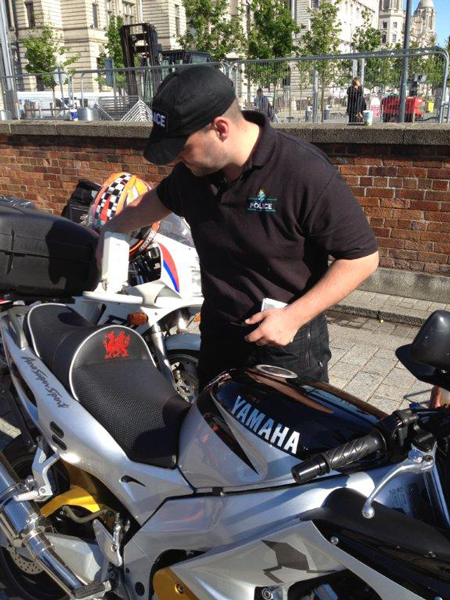 Sergeant Martin Mayne, from Merseyside Police's Vehicle Crime Group, said: "Liverpool is the gateway to the TT races for people across the UK and Europe. Merseyside Police is in a ideal position to impact on the national motorcycle theft picture by promoting ways to protect your bike regardless of where you live" The operation, called Operation Platina, was very well received by the motorcycling community, who are very aware of the impact – both financial and personal - that bike theft can have. "Prevention is better than cure and everyone we spoke to was very supportive of what we are doing - looking for stolen bikes and giving information to reduce the chance of them falling victim to theft"
Kevin Howells, Datatag Managing Director said "Datatag have long known the benefits of security marking components and our industry leading unique multi layered approach provides the most effective protection available today. 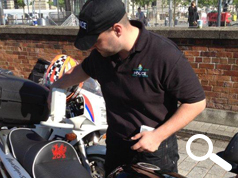 Not only that but our lifelong peace of mind comes at a single one off fee.’ He went on to say ‘We’re very pleased to have been able to help Merseyside Police with the operation as we are keen to see bikers protected as well as their bikes. We would encourage all bikers to do everything they can to help combat theft." Merseyside Police has more vehicle crime operations planned for the future to build on the success of Platina, and with the help of Datatag hopes to make a real impact on the National motorcycle crime figures.